Hey guys -- there has been a lot of chatter about Essential Oils lately, hasn't there? Is it hype or do these little bottles of liquid actually work? Well I'm glad you asked. I have a lot to say on this topic, so grab yourself a cup of coffee or tea and let's get down to business. An essential oil is that aromatic, volatile liquid that is within many shrubs, flowers, trees, roots, bushes, and seeds that is usually extracted through steam distillation. The chemistry of an essential oil is very complex and may consist of hundreds of different and unique compounds. Moreover, essential oils are highly concentrated and far more potent than dried herbs because of the distillation process that makes them so concentrated. It requires a large volume of plant material to produce small amounts of a distilled essential oil. For example, it takes 5,000 pounds of rose petals to produce 1 kilo of rose oil. Essential oils and plant extracts have been woven into history since the beginning of time and are considered by many to be the missing link in modern medicine. They have been used medicinally to kill bacteria, fungi, and viruses and to combat insect, bug, and snake bites in addition to treating all kinds of mysterious maladies. Oils and extracts stimulate tissue and nerve regeneration. Essential oils are not simple substances. Each oil is a complex structure of hundreds of different chemical compounds, which is why essential oils could never be patented. A single essential oil may contain anywhere from 80-300 or more different chemical constituents (Source: Essential Oil Pocket Reference). In 2005, I completely changed my lifestyle and became a passionate health advocate. I began extensive research on numerous health related topics and I developed such a drive to continue learning as much as possible. My primary focus (and why I started blogging) was targeted on fitness, health and wellness including alternative solutions and disease prevention, as well as learning more about genetically modified organisms (GMO’s), the FDA etc. What I ended up learning sparked this fire within me to want to share with everyone these “whistle-blowing” topics in sincere efforts to set convoluted issues straight. To this day, I’m still researching and learning, which I’m so thankful for because I always want to be able to make educated decisions for me and my family as well as help and inspire others. In 2011, my Dad was diagnosed with an inoperable Pancreatic Neuroendocrine Tumor (pNET). This was ultimately the catalyst for my radically strict lifestyle changes. Over the years I honed my research abilities and have been able to “dig deeper” with even more credible sources on various topics. Long story short, I can’t unlearn what I’ve been learning and strive everyday to share this invaluable knowledge with everyone I love as well as anyone who will listen! Young Living has been around since 1993. That’s 23 years. This is an established and transparent essential oil company that has literally mastered true Therapeutic Grade essential oils. Young Living owns their own farms and anyone can visit/participate in their harvest/distillation process. There are no other essential oil companies who own their own farms. Additionally, Young Living has the largest selection of single oils and blends. Young Living has set and guarantee the highest standard in their essential oils through what they call, the Seed to Seal 5-step process. I encourage you to visit their Seed to Seal website because it’s packed with information, including all their farms across the globe, as well as great educational videos. Young Living practices ancient & modern farming techniques. Their farms are completely non-gmo and are MORE than organic, which means that the Young Living “therapeutic grade” standard goes beyond organic in purity, scope, and potency. Not only is weed control performed by hand, but the ONLY pest control ever used is their very own essential oils. Young Living has a gentle (slow) steam extraction (low heat) technique as well as cold press & resin tapping methods used for their oils and will never compromise quality. Their quality standard is higher than what the essential oil industry requires, and they refuse to ever compromise that. * If you do your homework on essential oils you will learn that “Therapeutic Grade” is actually an industry term. It is not regulated by a government agency and is used loosely with other essential oil brands. This is exactly how the term “natural” isn’t regulated in the food industry. These intentional misleading marketing schemes to trick consumers infuriate me. Please note that you will see “Therapeutic Grade” mentioned throughout this post and is in fact intended to be defined as therapeutic, medicinal grade. Let’s talk about Young Living Essential Oils quality and why I only trust this company when it comes to my essential oils. The oils from Young Living are 100% essential oil. Nothing added. Nothing removed. They are not laced with chemicals or synthetics that are harmful and dangerous, and they are not lab replicated. They are not cut or diluted with a carrier oil. It’s taken directly from the plant. This gives peace of mind that even a 100% organic label from another company simply cannot give me. Additionally, Young Living is the ONLY essential oil company in the world that owns their own farms to grow their crops. Every other company has to buy their oils at some point — and yes, that includes every single other essential oil company out there. Young Living tests and maintains pure, organic, therapeutic grade from the time the seed is put into the ground to the time it is sealed into the bottle. Therapeutic grade essential oils are rarely, if ever, sold in retails stores. They might be organic, but they distill in a way that is cheaper and faster (hence the cheaper price tag), which kills the compounds that make up the molecules; meaning the healing properties are gone. So, don’t expect healing properties from them — which then I must ask, “what’s the point! ?” When oils are distilled at low temp, low pressure the healing properties are preserved, but it takes a lot of time and a lot more money to do it that way. Even essential oil companies that may claim they distill in this fashion are actually cross contaminated with other harvests, which include the use of various dangerous chemicals and synthetic compounds. Young Living is the only company that grows and distills ON SITE. They have their own distillers and guess what? We are allowed to visit their farms and check out their entire operation. What other company will allow that? The answer is none! Over 90% of the oils that are sold as “essential” are food or fragrance grades and are NOT suitable for healing applications. Young Living oils are safe to apply topically, diffuse/inhale AND ingest… this is because they are 100% Therapeutic Grade essential oil — more than organic standards. If you see “do not ingest” on the bottle, run in the other direction because you’re basically buying it for the smell only, which I actually don’t recommend even smelling. Just like the food industry, “legally” there only has to be 5% of the actual oil in there to be considered 100% whatever essential oil it’s claiming to be. SO WHAT’S THE OTHER 95%!?!? This is one of the main reasons Young Living Essential Oils are so great — there are no fillers, no additives, no chemicals, no synthetics etc. You could travel the world visiting their farms because it’s important to Young Living that these shrubs, flowers, trees, roots, bushes, and seeds are growing and thriving in their native regions. The fact is, we truly get what we pay for with essential oils. How Are Essential Oils Categorized? Natural Oils (Organic) and Certified Oils = pass oil-standard tests — may contain few, if any, therapeutic compounds. Therapeutic-Grade Essential Oils = pure, medicinal, most often steam distilled or cold pressed and contains all of the plant’s therapeutic properties. Let’s say you have a gallon of gasoline and a gallon of orange juice. They are both liquids, they both have a distinct odor, and you could technically put them both in the gas tank of your vehicle. However, only one is actually going to fuel your car and enable it to drive (pretty sure the OJ would do a number on your engine, too, so I don’t recommend trying this at home!). The same idea holds true for essential oils. Just because two similar bottles are labeled as ‘lavender essential oil’ and both at least resemble the smell of lavender flowers, it doesn’t mean they are the same quality or even meant to be anything other than a pleasant-smelling liquid. Moreover, the labeling in this industry is completely misleading, since as we already know by know "organic" &/or Therapeutic Grade means nothing if it was distilled with other crops and is guaranteed to have fillers (diluted with other unknown chemicals and synthetics). Most health food stores carry some version of the first three categories listed above. This is often where people get their first experience with essential oils, but they become easily frustrated when they do not see the expected results after using them. The reason I choose Young Living Essential Oils is because they fall into the last category above – 100% Pure, Therapeutic Grade. It is so important to KNOW your grower, to KNOW your distiller, to KNOW your supplier. Young Living only produces the BEST, which is why they are all three: grower, distiller, supplier. No other essential oil company can compete with Young Living’s Seed to Seal. In reality there is no “Battle of Brands”. “Because the profits are so high in selling cheap-to-produce non-therapeutic oils at costly-to-produce therapeutic prices, the temptation to do so has created many laboratories and teams of chemists who are very skillful in imitating the chemical composition of natural oils. Many of these are in France, with a reputation where excellent therapeutic grade oils can be obtained. Some unscrupulous French businesses bottle cheap adulterated imitations in containers saying “Made in France,” producing them for export only, knowing that they would never pass the rigorous French standards in a government testing lab. Some counterfeit oils are so carefully compounded they are virtually impossible to detect, even with the most sophisticated laboratory equipment. What some chemists do is to synthetically combine the ten or fifteen most abundant ingredients contained in a natural oil, which are the ones the testing lab will measure to see if the proportions are right. But a natural oil contains hundreds of components, most in trace amounts and most, as yet, of undetermined composition. Testing labs do not and cannot test for every component because it would be economically prohibitive and, at the time, scientifically impossible. The counterfeit companies know this and take advantage of it. Hence, when an authentic oil and a false oil are tested for their most abundant constituents, they can both look identical insofar as the analysis was taken. But the imitation oil will have no healing capability because it is dead. It would be like assembling all of the major parts of a cat in a perfect form and expecting it to perform as a real cat. The same amounts of hair, bone, skin and tissue may be there, but there is no life. Only God can give that. While the laboratory cannot always tell the difference between bad and good oils, humans can tell the difference right away. Either the oils render benefits, or they don’t. An electromagnetic frequency measurement would also reveal the truth, but chemical laboratories thus far, are not equipped for routine measurements of electromagnetic frequencies in the megahertz and nanovolt range, as would be necessary. Dr. Herve Casabianca (Ph.D.) Director of the largest essential oils testing lab in France and chairman of the International Standards Organization committee on oils, has come to the conclusion that the only way one can be certain that they are obtaining true therapeutic grade oils is to “Know Your Grower. Know Your Distiller. And Know Your Supplier. Otherwise,” he says, “the chemists have become so clever that they can sometimes fool even the best laboratories. Where does the actual, original plant product come from? The quality of an essential oil is largely based on the quality of the product from which it is extracted. This goes all the way back to the seeds that are chosen, where they are planted, and then continues through the entire growing process in how they are cared for and harvested. Young Living owns seven – SEVEN! – of their own farms across the globe and carefully monitors with feet on the ground the network of partner farms they work with. This is unlike any other essential oil company in existence and shows the level of Young Living’s commitment to providing the highest quality essential oils. How are the oils extracted? The method of extraction greatly effects the properties of the essential oil. The steam distillation, cold pressing, and resin tapping methods of extraction maintain the precious therapeutic properties of the plants. Young Living utilizes all three of these in their private state-of-the-art facilities and they are regarded as innovators in essential oil distillation. Is there a quality control procedure in place? If a company is not consistently testing and evaluating the quality of their oils, there is no way to guarantee their effectiveness and safety. Young Living tests their oils both on-site at the distilleries and with third-party facilities to ensure that they are producing the highest quality essential oils possible. How are the oils sealed and stored? Many companies ‘enhance’ their oils with different constituents to increase the volume or fragrance before bottling. Nothing is added to Young Living’s oils – they are the purest oil form of the plants they come from. They don’t smell like desserts or chemicals, just the earthy aroma of their plant origins! 100% Pure Therapeutic Grade essential oils should never go rancid or expire if sealed and stored properly. Young Living seals all of their oils in dark amber, glass bottles to protect their therapeutic properties. Every bottle is carefully labeled with the ingredients and other important information before arriving at your doorstep. * It is important to note that Young Living does NOT sell their oils to third parties. For safety and to ensure the quality provided by Young Living’s Seed to Seal promise, do NOT purchase from Amazon or other like websites. It is scary how easy it is to adulterate a bottle of essential oil. [To me] This topic will never be a “battle of brands” because I’ve done the research, I’ve called other companies, I’ve asked all the questions, and no one even comes close to Young Living’s transparency. Young Living’s quality of essential oil is much higher than any other “competitor” and simply cannot be compared to other brands. It's just not worth it. It's not safe -- in fact it's highly counter productive. Don't do it. Essential Oils Are For Everyone! 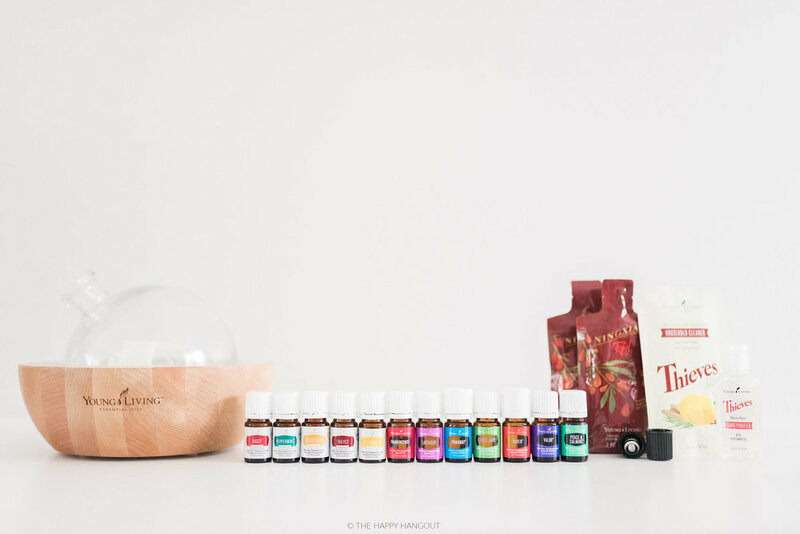 Most of my favorite Young Living Essential Oils already come in the Premium Starter Kit, which are all very versatile and can easily be incorporated into our everyday lives. I have literally been able to transform my “medicine cabinet”. These Young Living Essential Oils have certainly changed my life for the better and I wish I had started sooner. However, my personality requires me to research a topic to death, and I’m so glad. When it comes to Essential Oils the difference between hype, safety, and effectiveness is in the hands of the brand you choose. Through my due diligence and on-going research, Young Living remains the only brand I trust for my essential oils. If you have any questions about getting started, I’m here to help! I always recommend jumping in the same way I did, which is with Young Living’s Premium Starter Kit. It’s truly the best way to get introduced to a variety of the most versatile essential oils at a great price! There are several different Premium Starter Kits for you to choose from. 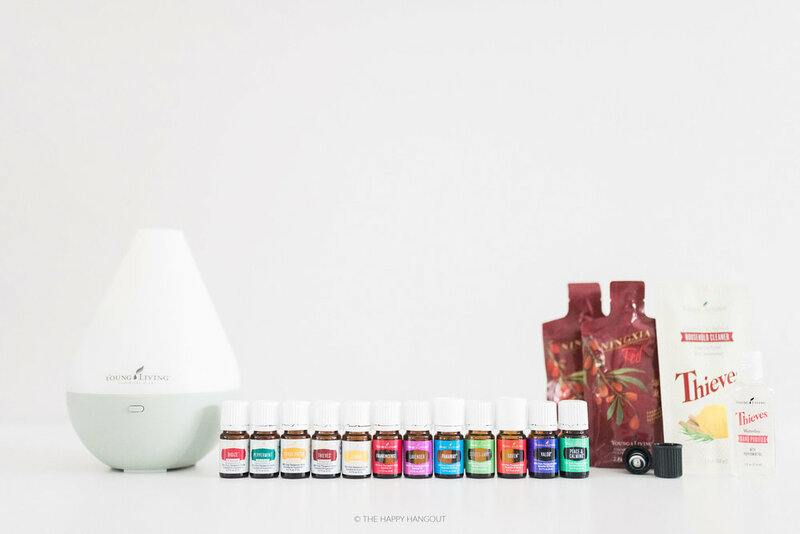 The most popular when first getting started is the Premium Starter Kit with the Dew Drop or Desert Mist Diffuser. Take a look at the slides below, for a visual of everything that is included in each Premium Starter Kit. * hover cursor over image to pause the slides. I use the Premium Starter Kit oils every. single. day. for various reasons. They are what I consider to be "staple oils" and I make sure to keep them with me even when I'm on the go. These oils are so versatile, I can't think of any situation where at least one or more of the PSK oils would help. I also always suggest adding Valor, Gentle Baby &/or Peace & Calming to your order because these are very amazing oil blends — but we can discuss anything specific you and loved ones might want to work through with your own Young Living Essential Oils and go from there. Depending on where you are located we can also schedule an iTovi scan. Are You Ready to get Oily?! 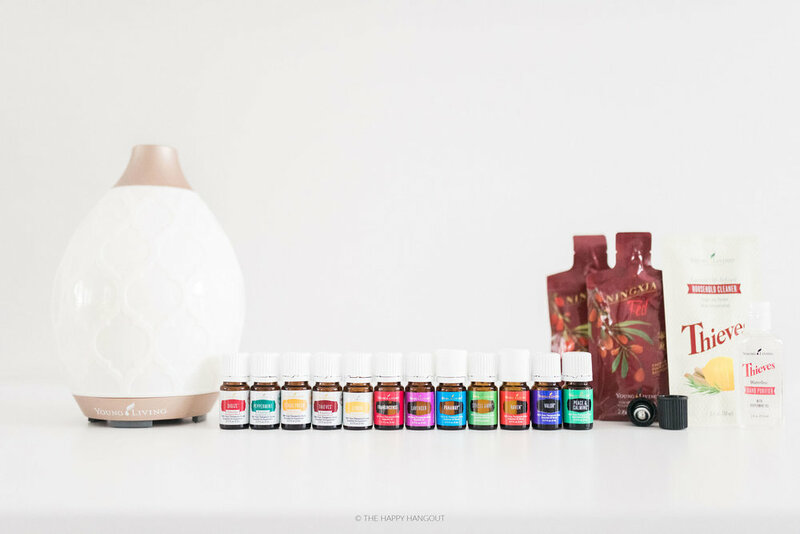 If you are ready to get some of your own Young Living Essential Oils, it is super easy to order and there are no strings attached. If you're familiar with Wholesale Clubs like Costco or Sam's etc. then you already know the drill. You can click HERE and follow the prompts to check out. If you would like step-by-step instructions, let me know! PLEASE NOTE: The default member number of 2155708 belongs to Jennifer Pederson, founder of Oily Adventures. If you were referred here by her -- fantastic! However, if you were sent by a friend make sure to enter your friends member number so you are attached to them. Oily Resources, Tools, and Support Is Important! We are very lucky to have an incredible Oily Support System and share all our tools and resources with our Members. We have several secret groups on Facebook depending on your needs, and each group is packed with vital information -- especially when just getting started and as you grow throughout your Oily Journey. It's also a much more private and personable way to communicate with us, which is always nice! We are just a friendly group simply sharing our oily experiences, favorite recipes, and quality research for educational purposes. Our group is a safe place for people to learn and grow at their own pace, ask questions, share personal experiences etc. No sales, just a great resource for exclusive oily information at your finger tips! We also offer virtual classes, such as Essential Oils 101, 102, plus other great educational events. If you are interested in being added to our Oily Adventures group on Facebook, feel free to ask your friend who sent you here or you can click the link below! We Are so looking forward to being on this Oily Adventure™ with you!